74 Pilling Street is a Two Family, three story brick townhouse perfect for an end user or investor. Built 20' x 55' on a 100-foot lot, this home features a wonderful 2 bedroom (convertible 3) duplex with two entrances and a private backyard, as well an upstairs rental unit with three bedrooms and a home office. The recently updated kitchen in the owner's unit comes complete with full size stainless steel appliances, plenty of counter and cabinet space, and a large center island. The cellar level boasts a finished basement with full height ceilings and features a washer/dryer hookup, approx. 1,000 square feet of recreation space, an internal staircase and a separate entrance. The bright and sunny rental unit offers a newly renovated kitchen and a washer / dryer hookup. 74 Pilling Street is less than a 5 minute walk to the L at Bushwick/Aberdeen and the J/Z at Chauncey. Also walkable to the AC trains. Little Skips, Salud, The Evergreen, Father Knows Best, Mac Donough Cafe, Lady Moo-Moo, Sonora, Pita Point and Nowadays (Mister Sunday!) 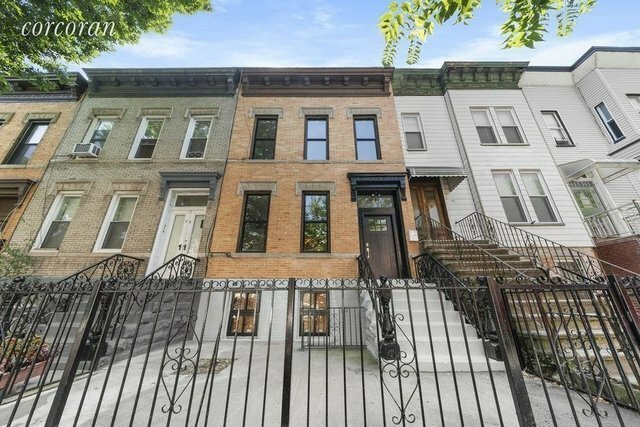 are just a few of the neighborhood gems within walking distance of this fantastic townhouse. Being zoned R6, this 20 x 100 ft lot allows for an additional 2,200 build-able SF.